Reflections of a Grady Doctor: Crazy and special. *images shamelessly jacked from here. 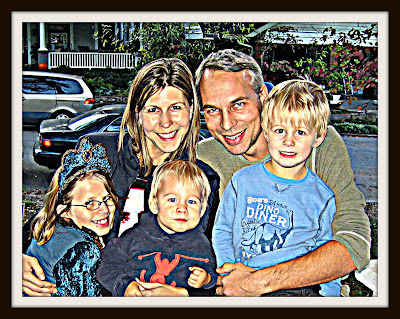 This is my friend, Kris R. and her family. Oh, and that super cute guy next to her is her husband, Mike. Those three gorgeous kids belong to them and yes, they are just as sweet as they appear. Kris and I met several years ago when she interviewed for a job at Grady. From the day we first met, we clicked in that cliche way people speak of when they talk of being friends-at-first-sight. At first, Kris was simply a great work buddy and colleague. Over (very little) time, her role in my life evolved to that of dear friend with quirks just like my own. It's such an easy friendship. Sometimes it's simply email. Other days it's reading each other's words typed into blogger and leaving comments that end in "xo." We LOL over wine in kitchens, periodically yelling out to pattering feet and repeated water requests with, "I SAID get back in the bed!" We leave voice mails on each others' phones that should really qualify as full on conversations since they're so long and filled with randoms, and whenever we do connect for phone chats, it always starts with, "Girrrrrl. . . . ."
Like I said, it's an easy friendship. Kris left Grady to take a job uptown at the Atlanta VA where she cares for homeless Veterans nearing the end of life. If you think Grady Hospital is like a ministry, just imagine what it's like for someone who affords unstably housed American heroes a death with dignity. But that's just her. That's how Kris rolls. Even though she doesn't work at Grady any more, any person who has ever worked at Grady knows that you can take the doctor out of Grady but never the Grady out of the doctor. So, yes. She is at the VA now, but Kris is sho' nuff a Grady doctor for sure and forever. I know. . . . here's the part where you start to wonder if I'm about to tell you some horrible thing about her, right? Like that she is ill or something else that makes you gasp and say, "That's awful. . . such a nice sounding lady, too!" Nope. No bad news. No sad ending. In fact, quite the contrary. . . .
Out of Africa: A Love Story. When Kris was in high school she took a trip to Kenya. She fell in love with the continent of Africa then, and has returned many times. One day we were chatting and she said to me with a wistful stare, "You know, Kim, the last time I was in Uganda, part of me felt like I could just unpack and stay there for good." And African-American me who admittedly has exactly zero desire to live even outside of the 285 interstate perimeter in Atlanta just sat there kind of looking at her and trying to get my head around that idea. "Umm. . .like. . live in Uganda? Uganda?" The words trampled out of my mouth before I could stop them. I was thinking more things like, as in not even on the Indian ocean or any coast, Uganda? As in like, where Idi Amin was, Uganda? It must've been all over my face. "Crazy, right?" She propped her bony elbow on the table and leaned her cheek into her face sighing. I offered her an awkward smile instead of saying what I was really thinking. Yes, that does sound crazy. Crazy for you to live in a lovely house with a white picket fence literally and one of the best schools in Atlanta in walking distance but want to move to a place where you are literally a speck of salt in a sea of pepper and also that loses electricity every night. Um, yeah, Kris. That sounds a little crazy. But it was only crazy in that hypothetical way, not that really going to pack up and move to the MIDDLE of Africa way. And I admit--part of me felt a wee bit ashamed for being black but not being wired with the same move-to-the-motherland gene that my (not black) friend was. So instead of giving her the hairy eyeball, we clinked wine glasses and Kris talked and I learned all about why she loved Africa so much that "Move to Uganda" was on her vision board. Again, hypothetically speaking, of course. . .kind of like, jumping from an airplane or riding a unicycle or climbing up Mount Kilimanjaro. 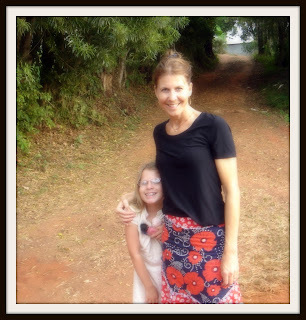 Last summer she decided to take Zoe with her on a brief visit to Uganda. And because you don't know Zoe, you don't know what a big deal this is. Zoe is wonderfully complicated and the kind of sweet that makes your teeth ache. She also has some special needs, particularly as it relates to her ability to synthesize people and situations. So much so that part of Kris' departure from Grady partly had to do with being afforded a schedule that would allow her to home school Zoe. And this is what she has done. Home schooled Zoe between caring for homeless, dying veterans and even though she will tell you in her brutally honest way that doing so is sometimes very frustrating and sticky and scary, she will also tell you that it is amazing and rewarding and perfect. So yeah. 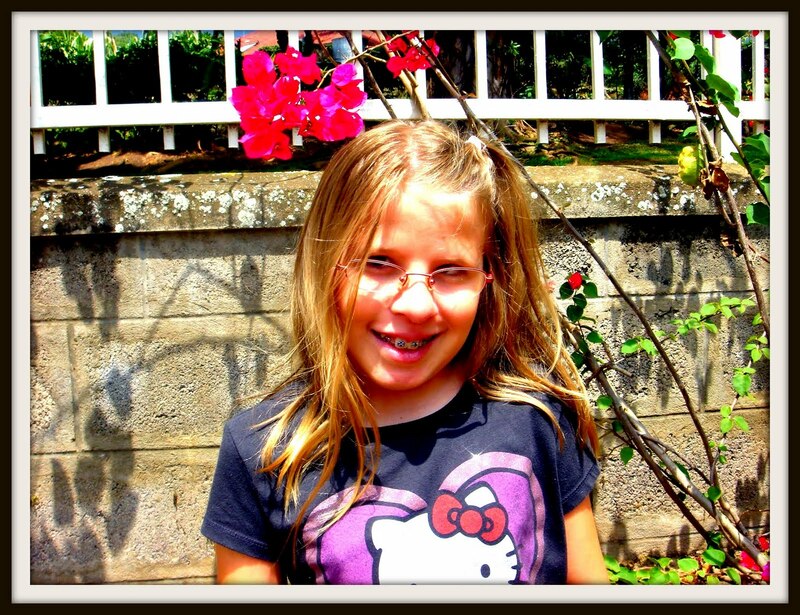 Taking Zoe to the middle of Africa was kind of a big deal. I hope you dance. . . .
Anyways. There was this one day when they were there and everyone was winding down at the safari campsite where they were. There was this big bonfire and the sounds of flattened palms beating African drums floated through the air. Each thump of the hide signaled a celebration of life and earth and living and people and loving and laughing. Native women decorated in colorful African fabrics danced traditional dances with reckless abandon. . . .shaking womanly hips and waving arms so dark that they seem continuous with the nighttime sky. Just as that pitch black night was starkly contrasted only by a smattering of gleaming stars and that crackling fire, inside that sea of ebony complexions stood the unexpected speckles of white skin with Zoe's awe-filled eyes. As the music grew louder and the energy was just about to explode, Zoe grabbed Kris' arm and said, "I want to dance!" And that's exactly what she did. She shook her tukas and shimmied her cocoa pops all night long without shame or stickiness or reservation. That one little speckle, oft times completely misunderstood immersed herself in a foreign culture, feeling the moves and the moment so much that, just like those lean, dark arms were with that sub-saharan sky, she blended right in. Except, in a way, she still stood out. But she wasn't just one of those twinkling stars in the darkness, this time she was the fire. And just like fires do, it drew everyone to her light. I nearly cried when she told me that story. I guess the most beautiful part was that with no American social norm or cell phones and Wii games and name brands to compete with, Zoe was in her element. Her special was a good special there. Despite her blond hair and white skin, she was less of an outsider there than in the United States. . . .and that was beautiful. That was the first time I sort of got it and didn't fully think her hypothetical move-to-the-motherland wish was crazy. Then. . . the unthinkable happened. Her husband, Mike, has this epiphany that he feels pulled to move to Africa. Yes. Mike, the uber-successful architect. The one that is married to the uber-successful physician. He, too, wants to maybe move outside of 285 and inside of the motherland, too. Now this hypothetical crazy just got real. Talk about frickin' stars aligning. Two people with shiny and pretty careers and electricity 24-7 have somehow not only found each other fell in love, but some twenty-plus years later found that they are both wired with the same move-to-the-motherland gene? Wait, and that they both want to do the same (crazy) thing at the same time? And so. Shortly after that, hypothetical became official. They talked about it as a family and listened to their children but most of all listened to their hearts. In a few short months, Kris, Mike, Zoe, Jude, and Bryn will be fitting their lives into ten suitcases and moving to Uganda. Kris will work in an HIV clinic that starts each morning with sun salutations and Mike will not only be creating blueprints but teaching people how to make them and build them into real, live buildings. The kids will attend excellent schools that, I'm sure, will be just a wee bit different than the ones here. And they're psyched about it. For real, they are. Probably because they inherited that same gene. So off they are going to Africa where Zoe will be the good kind of special and different instead of the sticky kind of special and different. When people yell out "Hey Jude" to Jude, it won't be in that sad Beatles way, but instead in that innocent and happy and loving way. Oh, and I wish I had time and space to tell you the story of sweet Sam/Jude, but it would only make you cry. A happy cry yes, but definitely a cry for real because he is here. So very here. . . . Aaaahhh, and that sweet, blue-eyed baby Bryn? He'll be running free and wild but never so far that he can't sink into his mother's lap. And as crazy as it sounds, I'm starting to get it. I am. Watching five people condense their lives down to ten suitcases does something to you. It reminds you of what is really meaningful like family and health and life. Watching someone boldly live their authentic dream and venture out to where the sidewalk ends is . . . inspiring. So, so inspiring. So check it. The added crazy is that all of this is done through donations. Bananas, right? We decided to give a monthly recurring gift--especially since we know they'll be there a minimum of like three years. Bananas, for real. So because I love Kris and keep feeling myself wanting to tell this story and share them with you, I will go out a limb and share their site with you. Giving to this crazy-wondrous-cool dream of theirs might be something you're feeling--maybe. And if not, no worries. I know that just hearing their story would at least make your day. Oh, and full disclosure, it's through a mission organization. Many global health initiatives that aren't government driven are often tied to religious bases. I see this as about something way bigger than religion. And, real talk, although I share the same faith as Kris and Mike, I would have given even if we didn't. I mean that. So, that's the story. The story of yet another Grady doctor who has not only taken the show on the road to the VA to care for the least of these, but is now taking it to the other side of the world along with a servant's heart. I guess I'm feeling a little emotional at the moment because I will miss waving at her street when I pass it and knowing that if I just turn the wheels of my car that I could see her face to face. I will miss my friend, I will. But I know that this is how she rolls, and I love her that. Okay, Kris. I admit. . .I do still think it's kind of crazy. But mostly, I think it's pretty damn special. . . .special in a good way. Zoe in Uganda: A good kind of special. I hope you continue to dance, sweet girl. i thank you for thinking and writing about us! I have always said that dancing is my favorite form of prayer. Beautiful post about a beautiful family. May their dream be fulfilled in a beautiful way. A bad reputation can be unfair. Grady and the VA both have bad reputations in this area. But the care my father received at the VA during the years between 1966 and 1983 was first rate. Likewise, the care that my brother-in-law received from Dr. Rose at Grady between 2006-2008 for his lung cancer was exceptional. Both equal the care that I get at St. Joe's and Northside for my many conditions. Sounds like Uganda is getting an equally bad rep. Maybe the bad things are keeping the good things from being able to shine through. Good people often live in bad places. It doesn't make them bad. It often means that they are the poor that Christ demands that we love and serve. Thanks for sharing your friend with us. Thanks for sharing your friend's story. I'm currently serving as a Peace Corps Volunteer in Cameroon and can identify with your descriptions of her fondness for Africa. It really is an amazing place. Although life has its ups and downs no matter where you are, I feel comfortable here in a way unlike any other place I've lived. I hope you have the opportunity to visit this continent - it truly is life changing!